Should we really say goodbye to Magento 1.9 and welcome Magento 2.0? I’m sorry to see Magento 1.9 go. Latest revision 1.9.2 is really stable and powerful platform. With latest improvements Magento 1.9 branch is up to a task to create multi-language and multi-currency platform under 3 weeks (Ekwb.com is a living proof). Want more? PayPal or Braintree, connection to accounting system, separated B2C and B2C sites under same site administration, maybe automatic estimate shipping? Magento covers it all, mostly of out the box. Why say goodbye now? EU TAX business rules, PayPal rounding problems … all solved. Magento – perfection? Latest support for EU Tax (Cross border tax) and EU VAT Validation is also a great improvement to better support EU Business world and its specific TAX rules (look at German Weichart.de). Problems with PayPal rounding if 4 decimals is used for Product prices has also been fixed. Specific PayPal IPN URL has been studied and multiple solutions are now available. Price2Spy can now connect with it’s API to specific store, for example to German store (http://www.weichhart.de/de/) or English store (www.weichhart.de/en) without hassle. Fast Re-indexing, support for large imports, responsive design — Magento 1.9 has it all! Re-indexing problems at larger numbers of products which has been the only valid point switching to Magento Enterprise from Community edition has been greatly improved in 1.9.1/1.9.2. Look at Pricaraj.si with LOTS of products (100k+). Even if you go wild with products (150.000+) and re-indexing gets slow, a Fast Asynchronous Re-indexing module works perfectly. It even works good on previous Magento versions like 1.6-1.7 if you clean Magento URL rewrites first (Stadionshop.si is an example). Importing larger XML files, importing XML/CSV/TXT sources from different partners (B2C price lists), stock updates on 100.000k products, import CSV export products from Navision (Microsoft Dynamics NAV)? No problem. Magmi, Magento Mass Importer is here to rescue us. Responsive design? No problem, Magento 1.9 with a new theme named rwd implements Responsive Web Design (RWD) practices. Also Sass/Compass: A CSS pre-compiler that provides organizable, reusable CSS and jQuery was added in base theme. Magento 1.9 – saying goodbye to platform at its peak performance and stability? Saying all that and working with Magento for last 5 years where we wanted all those features we have now in Magento 1.9 or fixed by other modules. Now, with security enhanced (latest patches) and all the stability, at the TOP of it’s form … we are now saying goodbye. Should we? Is Magento 2.0 really just a better platform for developers or it does add some benefits to customers who do not care about the jQuery or Prototype difference. They care about Magento development costs, availability and prices of modules, easer layout/design changes. In the end we should be asking ourselfs. 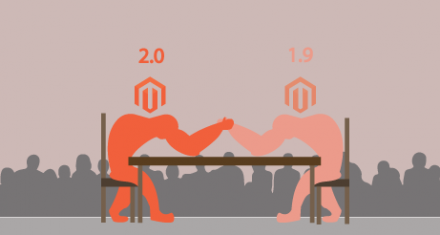 Does Magento 2.0 offer lower development and maintenance costs for customers or not? Better conversions? Easier marketing? More out of the box features? We will cover that in next blog post.